Published by Iberian Publishing Company as a reprint and retypesetting of the 1908 edition, 2003. During the Civil War, James Madison Page was a prisoner in different places in the South. Seven months of that time in 1864 was spent at Andersonville. While there he became well acquainted with Major Henry Wirz, or Captain Wirz, as he then was ranked. 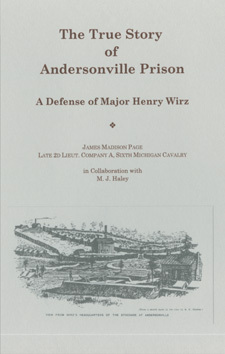 Page's premise, unpopular at the time of its writing but borne out by history, is that Captain Wirz, the prison warden, was unjustly held responsible for the hardship and mortality of Andersonville. It was his belief that the Union authorities must share the blame with their Confederate counterparts. The Union well knew the inability of the Confederates to meet the reasonable wants of prisoners of war; the Confederates lacked a supply for their own needs. More importantly, Union authorities failed to exercise a humane policy in the exchange of those captured in battle. 5 ¼" x 8 ¼" format, 220 pages, color cover, illustrations, Paperback.